Choosing a domain name might seem a fun job and most people confuse this job with just keeping a name that links visitor to a website. As a marketer’s point of view, a domain name is much more than just a word. Most businesses decide on picking their brand’s name as their domain name but this does not always work because a name that has been taken once, cannot be taken again so this means there is no surety that your brand’s name would not have been taken already. Ever wondered why is it important to be extra conscious while picking up on the right domain name? Your domain name literally engraves the primary impression on the audience. Not just this, it also affects your website’s SEO ranking and lastly it defines your brand. Therefore, it is highly recommended to be certain and thoughtful while choosing a name that links your audience to your brand’s website on the internet. 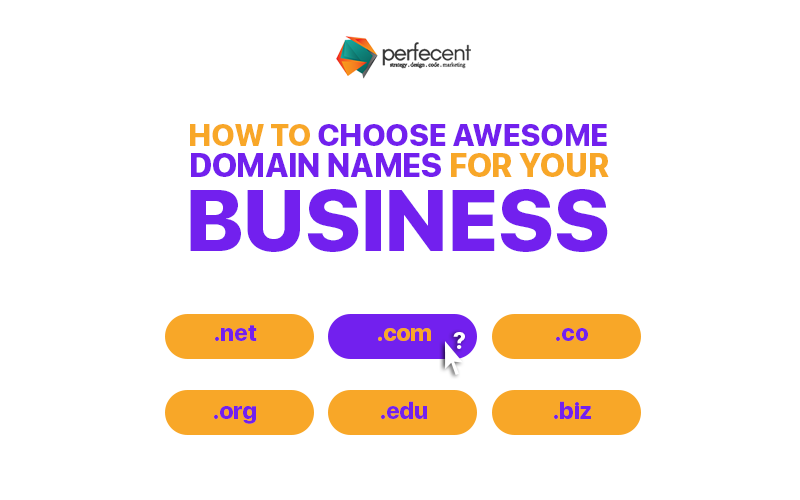 This blog will guide you with a few things that will lead you to decide an awesome name for your business domain address. Ideally your brand’s name should be unique, catchy and meaningful enough to be chosen as the domain. You must also assure that the name is so unique that it is not previously taken by any other hosting. Try fusion of words that define your business the best. Avoid using hyphens in your domain’s name – it confuses people to memorize the address. Do not settle for any other extension than .com while choosing the domain for your business. In case you find a domain available in .net, .org or any other extension, with the name of your choice, we would suggest you to change the name instead of shifting to another extension. Make sure your domain name is not too short or too long for people to memorize. Although there are no character limits or standards that are required to be maintained but we personally believe that a domain name must be precise and meaningful. Come up with the right keywords and use one of them in your domain name to make it recognizable for SEO purpose. Having a keyword in domain address creates a significant impact in your website’s worth on search engine and also provides it a meaningful ranking on Google bringing your website in the top search results.